The weather outside may be frightful, but there’s no reason you and your child can’t enjoy the season from the comfort of your own toasty living room. Instead of piling on jackets and mittens, settle down for an afternoon of paper magic with this three-dimensional snowflake craft. 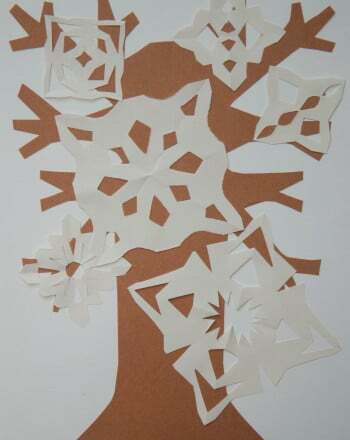 Have your child print the 3D snowflake templates on a sheet of white paper. Start off with the biggest square template -- this snowflake will be the easiest one to create. 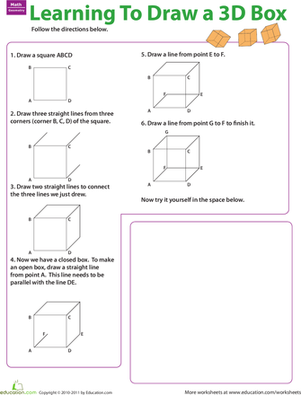 Let your child use scissors to cut the square out. Take a closer look with your child at the paper square. Does she notice how the printed lines make four squares within the cut-out one? Let her fold the square in half along the penciled line. The printed lines of the square should be facing out. She should now have a triangle in front of her. Four lines on the left side should rise diagonally to AlmostMeet with four diagonal lines on the right side. These four pairs of lines should be separated from meeting by less than a finger's width. Have her use scissors to carefully cut each of these printed lines. Make sure she starts each cut along the folded edge. When she's done, let her unfold the square and lay it flat on a table. Help her take the two unattached edges of the inner square (or diamond, depending on how you turn it) and curl them upward into a single loop. Have her secure this loop with tape. She should now have a piece of paper that is laying flat on the table except for the loop in its centre. Now have her flip the paper over. Once this second loop is secure, flip the paper over again. 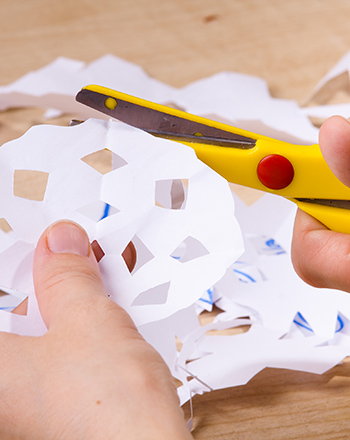 The key to this craft is the flipping -- if you don't flip the paper, the snowflake won't work. Let your child tape the third loop. Have her continue using this flipping and taping process to finish the fourth and fifth loop. She has now completed a sixth of her 3D snowflake! Have her repeat this same process to create five additional snowflake "arms." Help her gather three of her snowflake creations and join them by their ends. Have her use a stapler to secure the three together. Let her repeat this process with the other three snowflake pieces. She should now have two halves of her snowflake. Help her staple (or tape if it's being too unwieldly) the halves together. Have your child stand back and admire the paper wonder she has created! Can your child not get enough of this inventive and beautiful craft? She's in luck! 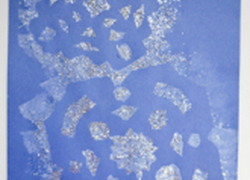 Help her use the smaller templates to create miniature snowflakes or she can even draw her own. If she needs some inspiration, have her check out these wacky and wonderful templates: Star template, Squiggle starflake template. Bundle up for this challenging crossword full of chilly snowflakes and wintry words.